The term “psychopath” has been frequently mentioned in crime reports to describe various aspects of the behaviour of people who seem driven to assert power and/or control over other people or inflict harm upon them. 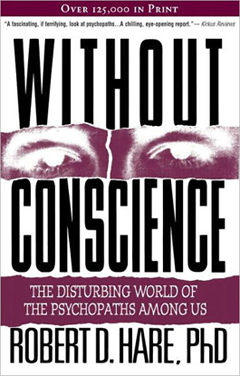 Psychologist Bob Haire of the University of British Columbia and author of the treatise Without Conscience has undertaken much research into the possible causes and characteristics of psychopathic tendencies. His research indicates that such tendencies can begin during the preschool years, possibly triggered by traumatic events such as a breakdown within the family structure, phenomena that affect an increasing number of families. Not so many decades ago, people in the West lived in extended family groups where several adults could care for their very young relatives. It is the view of this author that extended family networks where young children have frequent, perhaps daily positive contact with older relatives will make those children feel emotionally secure and lower their risk of experiencing emotional trauma. Even in this modern age, many societies and cultures still uphold the tradition of the extended family, where young children have frequent contact with parents, grandparents and parents’ siblings who can provide them with a sense of belonging. A functional extended family may be compared to a corporate conglomerate that includes different divisions providing goods and services to several sectors of the economy. An economic slowdown may affect the markets for some divisions, while other divisions may operate with little change and even transfer some of their workloads to the less busy divisions. During such a slowdown, some members of the extended family network may be laid off and need to seek new opportunities for employment in a difficult job market. The emotional support and encouragement from family members may help carry them through the difficulty. In times of economic difficulty, children living in an extended family environment may still be assured of a sense of belonging and of emotional security provided by the acceptance of older family members. They would likely also witness how emotional support from other family members can carry their parents or parents’ siblings through the difficult period. In contrast, children living in a nuclear family or single-parent home may witness a parent demoralized by a lay-off and by multiple rejections to job applications. These children would be at risk of experiencing a loss of emotional security. In Western countries, state social policy intended to benefit society has over the long term done much to undermine the traditional family structure, with a sharp rise in single parent families. Likewise, state economic policy, perhaps intended to create a perpetual economic boom, actually contributed to economic instability by fostering the business cycle of boom and bust. During the early 1990s, state economists believed that they could enable a perpetual economic boom in the high tech and information sectors of the economy, but political-economic management of that economic sector resulted in its meltdown by the year 2000. A large segment of a nation’s children live in homes that are being negatively impacted by the combination of state social policy, state economic policy and state tax policy. Single parents whose careers have been adversely impacted by the fallout from state economic policy may have a very limited capacity to nurture the emotional needs of their young children. Affected children may reach out outside the home to meet those emotional needs, increasing the likelihood of children competing with each other for the attention of schoolteachers and even gang leaders. One of the ways by which a government may assert influence and control over citizens is to undermine the institutions that provide emotional security and spiritual guidance, such as the extended family and religious organizations. The modern Western state school system from kindergarten to university seeks to increase future career opportunities for women, but achieves such an objective at the expense of young male students. Misguided state policy that promotes the emergence of dysfunctional families risks creating circumstances where a percentage of young children experience emotional trauma and lose the ability to feel empathy—that is, they develop psychopathic tendencies. There has been a surge of ruthless, even merciless peer-on-peer bullying in most public sector schools across the continent, often committed by seemingly socially adept, likeable, and popular kids who seek rapport with significant adults in the school. But they seem quite unaware of the emotional trauma that their behaviour inflicts on their peers, as if they had an absence of empathy. While Dr. Haire’s research indicates that the majority of psychopaths tend to be male, the rise of girl-on-girl social bullying in junior high and high schools indicates a similar lack of empathy in girls. The recent rise in psychopathic tendencies and ruthless peer-on-peer bullying in school-age children, as well as the tendency of boys to gravitate toward gangs and girls toward exclusive cliques, may be the unintended long-term result of a wide range of originally well-intentioned government policies. Several school districts have attempted to resolve the bullying problem through a zero-tolerance policy, but zero tolerance has failed in most school districts. Given the reluctance of state officials to admit the failure of state policy, the circumstances that give rise to psychopathic tendencies in young children will likely remain unresolved for some time.